Super Savings Item! 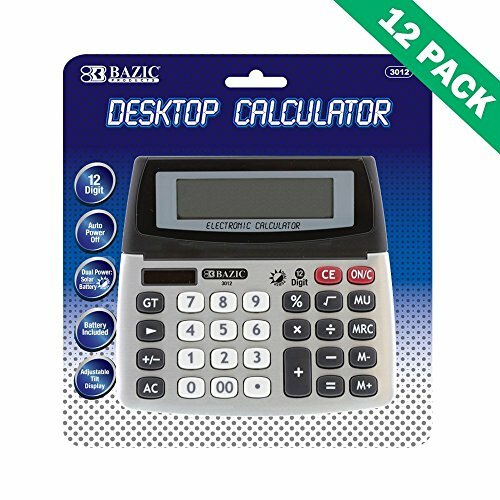 Save 38% on the Desk Calculator, 12-digit Desktop Calculators For College (case Of 12 Units) by BAZIC-PRODUCTS at Ledina. MPN: E7-B3C7-E12D. Hurry! Limited time offer. Offer valid only while supplies last. Dual powered - desktop office calculator uses both solar and battery power. Adjustable - solar calculator desktop features a display that tilts for your comfort. Power-saving - dual power calculator turns off automatically to conserve power. Multi-pack - 12-digit calculator solar comes in a case of 12. Office desk calculator weight: 5 lbs; college calculator dual powered dimensions: 16.5" x 5" x 8"
If you have any questions about this product by BAZIC-PRODUCTS, contact us by completing and submitting the form below. If you are looking for a specif part number, please include it with your message.